The Frontiers of Flight Museum will host the Collings Foundation’s Wings of Freedom Tour in honor of WWII Veterans. The Wings of Freedom Tour will bring extremely rare bomber and fighter aircraft to North Texas for a local living history exhibit as part of 110-city nationwide tour. Visitors will not only get a chance to view the interactive display, but they will also have an opportunity to “fly into history” aboard these legendary aircraft. 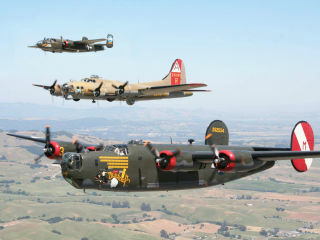 Flights on either the B-17 or B-24 are $450 per person. P-51 flights are $2,200 for a half hour and $3,200 for a full hour. B-25 flights are $400 per person. Huey flights are $80 bench/$100 front. For reservations and information on flight experiences, call 800-568-8924.